Chester History and Heritage, the local and family history resource is now based at the History Hub at the Grosvenor Museum in Chester. Chester History and Heritage support family and local history research, they have a local history library and run a very popular Facebook page sharing historic photographs of Chester from their image bank. It also works with volunteers from the Chester group of the Family History Society of Cheshire to provide expert advice to family historians. 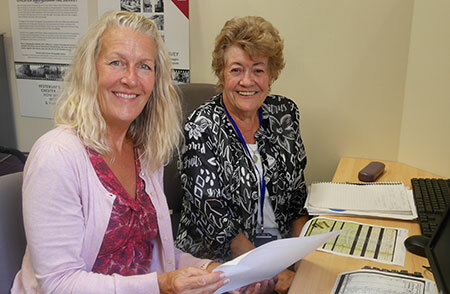 The volunteers help people to unearth people’s family stories from the 20th century back to the time of Queen Elizabeth I. An open morning took place on Tuesday 21 August to showcase the activities of the service and promote the work of the dedicated volunteers. The service also provides free access to popular online family history resources such as Find My Past and Ancestry and administers events such as Heritage Open Days across the borough. Councillor Louise Gittins, Cabinet Member Communities and Wellbeing said: “The Grosvenor Museum welcomes over 80,000 visitors each year which provides a large audience for the team. They are now looking for ways to improve access which could include bringing the service into different buildings and sharing its exhibitions with more locations across Chester and the wider borough. Chester History and Heritage are open Monday to Friday 10.30am to 5pm and the first Saturday of the month, 10.30am to 5pm. A questionnaire is available online at cheshirewestandchester.gov.uk/consultation and at the Grosvenor Museum and the Cheshire Record Office.